To Cite: Rokni Yazdi H, Abtahi H, Saberi H, Salahi M. Coil Embolotherapy of Unilateral Diffuse Pulmonary Arteriovenous Malformations in a Nineteen-Year-Old Woman, Iran J Radiol. 2015 ; 12(3):e9632. doi: 10.5812/iranjradiol.9632. Pulmonary arteriovenous malformations (AVMs) are rare vascular malformations of the lung that usually led to a notable risk of serious and life-threatening complications. There is considerable debate about the best management of strategies for the group of patients with diffuse AVMs. Several therapeutic options have been reported for management of this abnormality among which coil embolization is currently the preferred ones. This report describes our experience with the use of coiling method for treatment of multiple AVMs in an adult patient. Pulmonary arteriovenous malformations (AVMs) are direct communication between feeding arteries and draining veins, which bypasses capillary bed and causes ineffective filtering in lung with direct access of particulate material such as clot and bacteria to systemic circulation, especially cerebral circulation (1). It can be also accompanied by severe hypoxemia via right-to-left intrapulmonary shunts that might develop pulmonary incapacitation in severe conditions (2). It has been recently reported that 7% to 11% of patients present a diffuse form of pulmonary AVMs with involvement of several pulmonary segments and lobes. This diffuse pattern variably involves every segmental or every subsegmental artery of at least one lobe (3). Little is known about the subgroup patients with diffuse pulmonary AVMs, their clinical manifestation, disease course, and the best management because only few cases (about 30 cases) have been reported in the literature (4). Recently, several therapeutic options have been reported for treating this abnormality. However, the number of publications reporting the use of embolization to treat unilateral diffuse pulmonary AVMs is still very limited. Among these medications, coil embolization is currently the preferred one. This report describes our experience with the use of coiling method for treatment of multiple AVMs with unusual morphology in an adult patient. A 19-year-old woman with a history of chest pain and exertional dyspnea from seven years ago presented with transient cyanosis in both upper and lower limbs that was improved after 15- to 20-minutes resting. She also mentioned repeated common cold with fever and hemoptysis within the recent six months. No history of epistaxis, trauma, liver diseases, transient ischemic attack, brain abscess, or brain ischemic and/or hemorrhagic events and no family history of hereditary hemorrhagic telangiectasia (HHT) was detected. We could not evaluate AVMs in other organs such as cerebral and liver properly due to patient’s dissatisfaction. Her vital signs at the admission were stable with the systolic blood pressure of 90 mmHg, diastolic blood pressure of 60 mmHg, heart rate of 80 beats per minutes, and respiratory rate of 20 per minutes. Physical examination at rest showed a mild cyanosis, clubbing, and mild tenderness in right lower quadrant of the abdomen with no organomegaly; no mucosal or skin telangiectasis were noted. The patient gradually became bedridden during her hospitalization. Table 1 summarizes laboratory findings and arterial blood gas parameters. A marked increased serum hemoglobin and hematocrit concentrations as well as increased red blood cell count was observed in blood analysis. Moreover, both O2 saturation and arterial O2 pressure were significantly decreased at the admission. Findings of two-dimensional echocardiography were normal. Contrast-enhanced transesophageal echocardiography confirmed extracardiac right-to-left shunt. Findings of abdominopelvic sonography were normal. The chest radiograph showed an increased vascularity of the right lung compared to the left one. The thoracic computed tomography (CT) images showed small peripherally located branching opacities and the prominent vessels in the right lung. 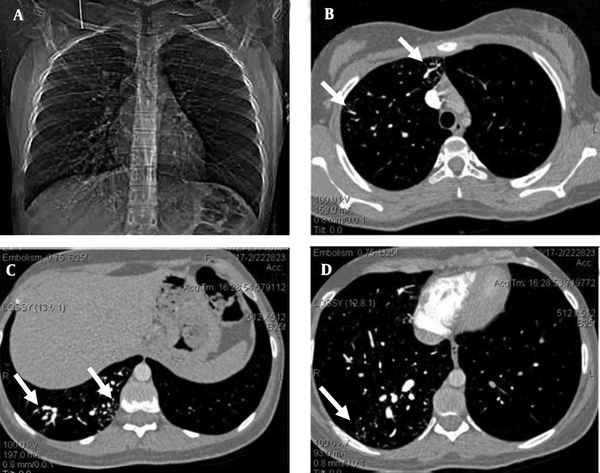 The pulmonary CT-angiography (64-detector, Siemens, Germany) showed multiple scattered, small, dilated vessels in the right lung with a probable diagnosis of multiple AVMs or pulmonary telangiectasia (Figure 1). Figure 1. A 19-year-old woman with chest pain, exertional dyspnea and cyanosis of the limbs. The pulmonary computed tomographic angiography. A, Scout view, shows multiple dilated vessels of the right lung; especially right lower lobe. B, C, and D, Axial contrast enhanced computed tomographic angiogram source images shows scattered dilated vessels throughout right lung (white arrows); left lung is normal. The pulmonary angiogram (GE, Innova 4200, Edison, New Jersey, USA) via right femoral vein access using Pigtail and Cobra II catheters (Torcon NB Advantage Catheter; Cook Inc., Bloomington, Indiana, USA) confirmed the former diagnosis. The morphology of the AVMs was similar to cerebral AVMs instead of usual pulmonary AVMs (Figure 2). Figure 2. A,B, Selective pulmonary angiograms. The images show multiple small abnormal vessels (white arrows) with early venous drainage (white arrow), which show a different morphology from usual pulmonary arteriovenous malformations. We planned to coil no more than half of the lung in each session due to risk of complications such as pulmonary infarction; however, the main factor for the end point for each session was the patient tolerance; when she was restless, the embolization process was ended. The embolization was done to redistribute pulmonary flow from the AVMs to normal lung. Percutaneous coil embolization of these malformations was achieved in three successive sessions with a one- to two-month interval and all detectable AVMs were occluded using 14 Pushable coils, (diameter, 3-5 mm) Tornado & Nester coils (Cook Medical Inc., Bloomington, Indiana, USA) (Figure 3). Figure 3. A-C, Multiple pushable coils are used to occlude feeders to the pulmonary arteriovenous malformations (Black Arrows). After second embolization session, patient experienced a severe pleuritic chest pain and mild pleurisy that disappeared after two weeks. One month after the last embolization session, a noticeable improvement in the patient's respiratory symptoms was reported although PIO2 only increased from 48.2 to 51.1 mmHg after one month of final session of coiling. One-year follow-up of patient showed that she had obtained her normal daily functions without any complain; however, because the patient was in another city and she stated that she was well and did not need any procedure, she refused to do any imaging study. Nonetheless, as seen in Figure 3, previously occluded AVMs were still occluded in final session and no new collateral formation was noted during a three- to four-month period. Pulmonary AVMs are manifested by fistulous shunts of high-grade flow between the pulmonary artery and vein. Most of the cases are originally congenital anomaly; however the original etiologies in some patients were acquired including liver cirrhosis, schistosomiasis, mitral stenosis, trauma, actinomycosis, metastatic thyroid carcinoma, and bronchiectasis (5). About 70% of these cases are related to HHT (6). We used Curacao criteria for diagnosis of HHT, which includes cerebral, pulmonary, or hepatic AVM, epistaxis, and family history of HHT (7). Our patient did not meet the criteria of HHT. Except for severe and complicated conditions, multiple AVMs and its related telangiectasis are usually asymptomatic until early adulthood (5). Our presented case was a severe type of multiple AVMs that presented within early adulthood with limbs cyanosis, decreased arterial O2 saturation, and recurrent respiratory problems mandating clinical evaluation. Other manifestations of the current study were abnormalities of laboratory parameters, particularly elevated hemoglobin and hematocrit concentration, which can be frequently detected in such cases. Digital subtraction angiography (DSA) allows diagnostic selective bilateral pulmonary angiography and embolization, with less contrast material and in a shorter time (7). For individuals with pulmonary AVMs, it is an effective means of reducing lifetime risks of paradoxical embolic stroke and brain abscess, improving oxygenation, and treating pulmonary AVM-related hemoptysis. The main indications for pulmonary AVM embolization are to reduce the risk of paradoxical embolic stroke and to improve dyspnea and exercise tolerance for individuals with hypoxemia (6). Coiling is the most common used embolization method accompanied with the least minor complications such as chest pain or pleurisy; pleuritic chest pain is the most common complication seen in 12% of patients (5, 8). Early recovery and outpatient management are important advantages of this therapeutic method and causes greater compliance in patient and family (7). Due to small number of reported cases of multiple pulmonary AVM, there is no treatment criteria in such patients. The other treatment options are lung transplantation, pulmonary arteries bandage, and detachable balloons, which are used in pulmonary AVMs with larger feeding arteries (diameter > 7 - 10 mm). Following coil embolization, increased arterial O2 saturation and pressure is expected that seems to be associated with a high cardiac output as a major protective mechanism against hypoxemia (6). It has been revealed that the embolization of visible vascular malformations lead to a parallel decrease in shunt and cardiac index. In fact, the effective occlusion of all visible multiple AVMs is usually associated with a major improvement in the exercise capability and daily activities of the patient, although the blood gas test does not show significant improvement (6). Such improvement was observed in our reported case that manifested by her improved daily activities. Therefore, this treatment method can be considered as one of the best selective therapeutic approaches in patients with confirmed multiple AVMs. We hereby appreciate all staffs of Pulmonary Disease Ward for helpful efforts in data gathering. We also are indebted to the staffs of Radiology Ward of Imam Khomeini Hospital, Tehran University of Medical Sciences, for their excellent help.